Forty-five amateur chefs are sweating it out in the kitchen, preparing to compete in the 7th Annual SCV Charity Chili Cook-off. People’s Choice and Judges Choice prizes will be awarded to the top three chili’s in each category. Since 2012, proceeds have benefited many local nonprofit organizations. Last year we were able to donate $40,000.00 to the Wish Foundation and hope to increase that this year! Opportunities are still available for sponsors and contestants. So grab your secret family recipe, get your Chili pot out of storage, and get cooking. The fee to enter the chili cook-off contest is $125. 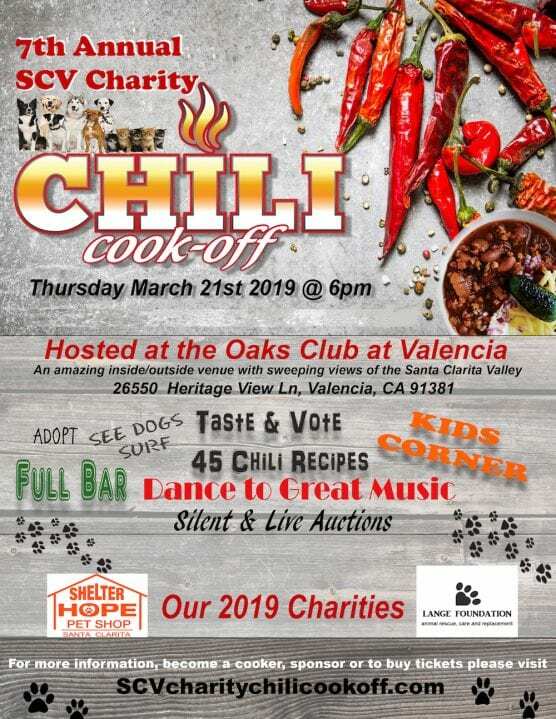 The SCV Charity Chili Cook-off will take place at 6:00 p.m. on Thursday, March 21, at The Oaks Club at Valencia (formerly the TPC). Attendees will enjoy live entertainment, silent and live auctions and a 50/50 opportunity drawing. General admission: $25 online through Feb. 14. After Feb. 14 tickets will be $30. To sponsor, register as a chili chef, or purchase tickets, visit scvcharitychilicookoff.com or call Nicole at (661) 816-4234. What is the deadline to register our club as a chili chef /sponsor?